Place cream cheese, green onion and cheese in a mixing bowl. Using a hand mixer, blend until smooth. Form into the shape of a pumpkin with your hands. Place on a large piece of plastic wrap. Wrap up tight and refrigerate for at least 3 hours or until firm. Remove cheese ball from the refrigerator. Run your thumb up and down the sides to form the ridges in the pumpkin. 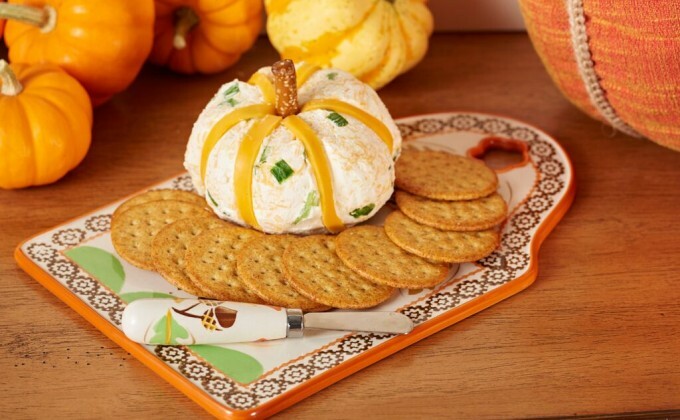 Remove plastic and place cheese ball on your temp-tations® cheese board. Cut the two orange cheese slices into 1/4 inch strips. Lay them in the ridges to create the look of the pumpkin. Stick the pretzel rod in the center for the stem.